Présentation en anglais 330 questhouses throughout France selected for their charm In the countryside, by the sea, in the mountains or in a chateau: . 129 guesthouses costing less than 100 . . 143 guesthouses with a swimming pool. . More than 650 photos. . 14 detailed regional maps. 1001 details to help you pick the right place: . Catering for all types of holiday: whether you are sporty, a gastronome, an art lover or you simply want to relax. . Guesthouses for those with traditional, or more unusual tastes in décor! . 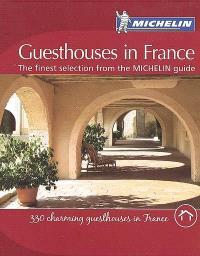 Guesthouses with terraces or gardens. . Information on activities to do in the local area... even on rainy days! . Without forgetting the quality of their breakfast, of course.